This picture has been rated : 108 times. Advice: 3D background, while dimishing the width of the tank, really do help create a very natural looking environment.Remember it's a hobby, not a piece of art. My tanks are never finished, always changing, regularly testing everything from water flow, layout, chemistry, stocking, etc. Corals/Plants: Currently plastic.. live soon! There are no comments on this photo yet. 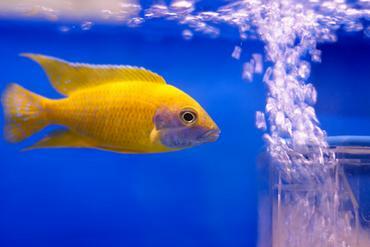 Learn how to properly cure live rock before placing it in your tank. 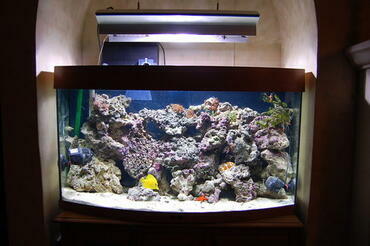 Modern advances in technology affect every industry - even the aquarium hobby. 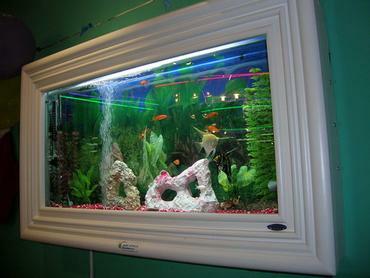 Advantages and disadvantages to a Wall Mounted Fish Tank.